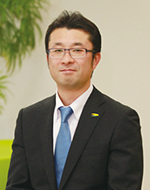 President's Message | Company Profile | NIPPON BEARING CO., LTD.
President of NIPPON BEARING CO., LTD.
NIPPON BEARING will embark on a new beginning under our new logo. Since our establishment in 1939, NIPPON BEARING has been highly recognized and widely supported globally as a pioneer of linear motion products manufacturer. Now, we are rejuvenating our new logo to show our determination to provide our products and services to satisfy our customers much further. We move forward with a complete domestic R&D and production based in Ojiya, Niigata, improving Japanese-made high quality and reliability while comprehend customer’s precise needs and issues to be solved. In global markets, we are enhancing our sales on the basis of our elaborative marketing. With our new logo, you can expect NIPPON BEARING’s work to accommodate our “customer’s needs” and manufacturing to be appreciated by our customers down the road.